The main focus this spring semester will be to finalize and start writing syllabi for the Summer Zero and first semester courses, to get those approved in time for their offering. Summer Zero will be a multi-week bonding experience for the entering class of students, aimed at preparation for success in college, a little bit of math, coding and writing skill-building, and getting to know SF and USF. We want students to experience engineering problem-solving from day 1, so this experience, as well as key courses in the first and second semester, will be project-based. Also this spring we’ll be working with the Admissions office to set admissions criteria, and rolling out an informative website for our prospective student families as well as the current USF community. 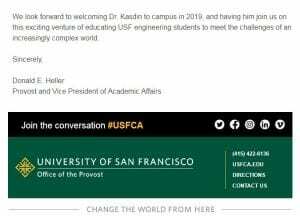 Next week we will be having two info sessions (generally same content at both) to help update the whole USF campus community about the Engineering program. 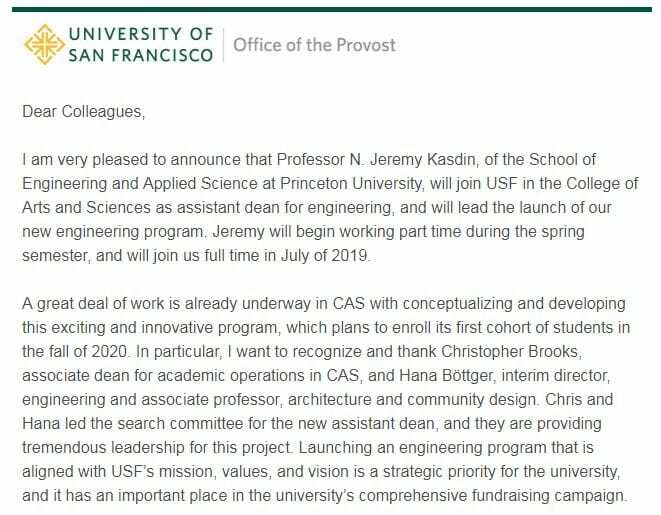 CAS Assoc Dean Chris Brooks, CAS Resources and Planning Manager Katie Baum and I will present a few slides summarizing where we are with the overall planning, and then open it up for questions from attendees. Please spread the word and plan to attend! Thur 8 Nov, 4:00-5:00pm in Lo Schiavo Getty Study. The curriculum development team has worked on the draft curriculum for some time now, developing the first two years to keep the cohort together, and the second two years to develop skills in one of the concentration areas. Now we are ready for some external feedback to make sure we are on the right track as far as employability and grad schools, whatever our graduates may aim for. To that end, we have invited a number of professionals in each of the four concentration areas to come to campus for a “curriculum critique event” on Friday October 12. We are looking forward to this feedback in order to tighten up this curriculum and move forward in the process of seeking new program approvals from our College of Arts & Sciences Curriculum Committee as well as the university-level approvals from WSCUC. Please get in touch if you have professional “advisors” to recommend, or would like to see the curriculum draft yourself! We are excited to start working with Jeremy to bring him on-board and provide him with the support he will need to successfully lead this program. Nice to see so many familiar faces today at Convocation, and many more new to come on Tuesday. As was mentioned in both Fr Paul’s Convocation talk and Dean Camperi’s College address, the work on Engineering is full-speed ahead. A newly expanded Engineering Curriculum Committee will start meeting in late August, hitting the ground running with updates and tasks to help solidify the curriculum. At present the idea is still to offer a single undergraduate Bachelor of Science degree in Engineering (non-specific), with the possibility to pursue a concentration in one of four areas: Computer Engineering, Electrical Engineering, Environmental Engineering, and Sustainable Built Environments Engineering. These four were developed based on current strengths in the College, and more can certainly be added as we discover or develop other areas of demand. In case you are wondering, there are a number of universities out there which are liberal arts colleges offering an accredited B.S. 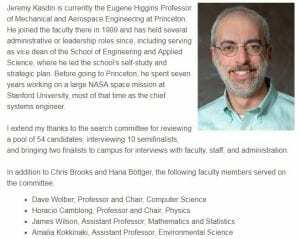 in Engineering, such as Swarthmore, Lincoln U, Davidson College, Harvey Mudd and more. We intend to provide a thorough liberal arts experience with practical professional training so that our graduates have a great shot at graduate school or employment as well as a sustainable approach to lifelong learning. If you want to hear more tidbits of what we learned, or the long version, contact us anytime. Many of us are working over the summer. How do you assess student-centered pedagogy? How do you know it’s working? What will be the best structure for our new program? How do you make sure students in a general B.S. in Engineering are able to pursue a Professional Engineer License (PE)? Let us know if there are other questions you think we should ask. In preparation for the workshop, one assignment we got was to interview a number of our current students in order to be able to make a “persona” to then use for the rest of the week for the student-centered pedagogy exercises. 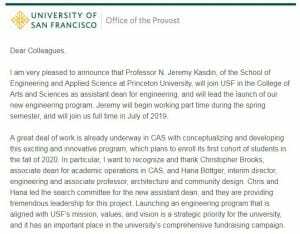 USF is so diverse, though, that we will likely end up with a number of personae! Just conducting the interviews themselves has been highly informative. Next Tuesday May 15 will be our first Innovation Nexus planning meeting! The “Innovation Nexus” is meant to be both a physical space for innovation, ideation and creation, and also a center to support innovative teaching, to bring together students, faculty, staff and external partners around interdisciplinary team-based projects. While it has engineering at its heart, it’s really meant to be something that serves the whole campus and acts as a catalyst for innovative thinking and teaching. – A Coding Studio, providing support and training for students of all majors who are interested in applying programming concepts to their projects. – Support for team-based teaching, linked classes, “drop-in” modules that can be plugged into other classes, and co-curricular activities such as hackathons and design challenges that encourage cross-disciplinary collaboration. – Training and support for faculty to bring design thinking and project-based learning into current classes. – Development of a physical space (and accompanying equipment) to support ideation, prototyping, fabrication, testing and computation. – Engagement with outside partners on real-world team-based projects, ideally spanning multiple semesters. I really did not have any expectations going into this engineering accreditation workshop/symposium – well, maybe I expected it to be a little dry – but it was in fact quite inspiring and encouraging! There was a great deal of talk about student-centered, project-based, real-world learning, the value of diversity and inclusivity, represented in everything from the President’s remarks to virtually every workshop I attended. The President of Olin College of Engineering, Rick Miller was a plenary speaker and went so far as to say that, done correctly, engineering could be the liberal arts of the 21st century – and that it is too dangerous to send engineering grads out in the world without a proper understanding of the humanities and social sciences. 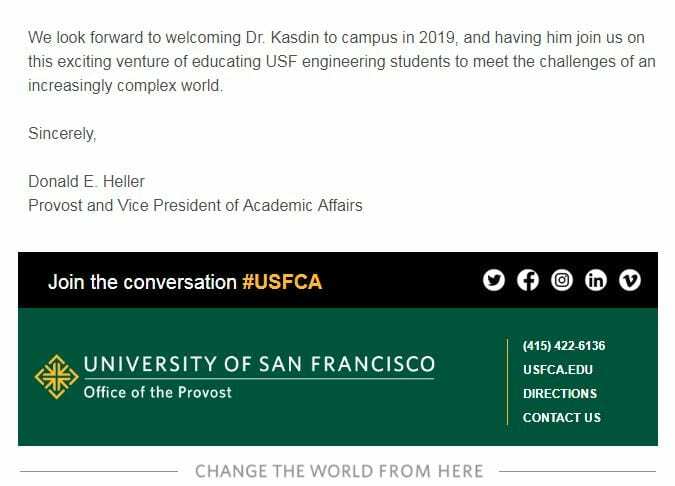 This is exactly in line with what we hope to build here at USF, so hearing this message from the official platform of engineering education accreditation was extremely encouraging. There was also a lot of talk about basic strategies to attract and retain a highly diverse faculty and student body – specifically to attract more women and underrepresented minorities (in engineering). There was discussion about the need to reach all the way back to K-8 and improve the language around engineering to reflect the societal and environmental care that is the goal of so many engineering fields. Engineering is still regularly “masculinized” and made to sound aggressive to young people, when in fact most engineering problems cannot be solved without a balanced, humanistic approach. There was also discussion about presenting an overall theme to our program, even reflecting it in a clever title, in order to emphasize that engineering is to help people. I also learned a lot of nuts and bolts about achieving accreditation, and found that the criteria and procedures seem very reasonable, with a lot of deference to our institutional values, and how we understand our program to be unique. Let me know in comments or feedback if you want to know more details of this. All in all it was a very affirmative experience – I am confident we are on the right track!